This is my first time participating in the Book Blogger Hop and I'm pretty jazzed up about it! The question this week: If you could be a character from any book, who would you be? Oh yes Mr. Darcy, please tell me how ardently you love and admire me! Please? LOL! Who wouldn't want to be married to Mr. Darcy? Especially when his character is played by Colin Firth! Truly true! Heck, I could have picked Bridget Jones..I could have him that way as well, lol. 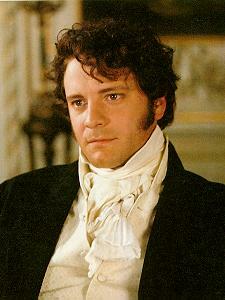 Agree on Mr. Darcy and Colin Firth. I so much prefer the BBC version of P&P to the newer movie. I couldn't agree more Holly. That reminds me, I don't own that movie..hmmm. THANKS for stopping by my blog....NEW FOLLOWER and NEW E-MAIL SUBSCRIBER to your blog.